We seem to be pinning down the chemical activators of our vestigial instinctual behavior drivers. I am not sure were this will take us, but I suspect that we will ultimately engineer perfumes that allow us to play with lust and aggression onn demand. That is hardly a bad thing be ause what comes with that is the learned discipline needed to control the effects. Once a person understands that these emotions are induced he or she can stop attempting to rationalize them and recognize them for what they are. We sort of know that they are there but they are also normally quite subtle and easily sneak up on one. Now we may begin to break out the full spectrum. In an unexpected finding, Ron Yu and his team revealed that potassium channels contribute to the primary activation of the vomeronasal organ, which detects pheromones. Credit: Illustration: Courtesy of Dr. Ron Yu, Stowers Institute for Medical Research. The vomeronasal organ (VNO) is one of evolution's most direct enforcers. From its niche within the nose in most land-based vertebrates, it detects pheromones and triggers corresponding basic-instinct behaviors, from compulsive mating to male-on-male death matches. A new study from the Stowers Institute for Medical Research, published online in Nature Neuroscience extends the scientific understanding of how pheromones activate the VNO, and has implications for sensory transduction experiments in other fields. "We found two new ion channels-both of them potassium channels-through which VNO neurons are activated in mice," says Associate Investigator C. Ron Yu, Ph.D., senior author of the study. "This is quite unusual; potassium channels normally don't play a direct role in the activation of sensory neurons." Humans have shrunken, seemingly vestigial VNOs, but still exhibit instinctive, pre-programmed behaviors relating to reproduction and aggression. Scientists hope that an understanding of how the VNO works in mice and other lower mammals will provide clues to how these innate behaviors are triggered in humans. The VNO works in much the same way as the main olfactory organ that provides the sense of smell. Its neurons and their input stalks, known as dendrites, are studded with specialized receptors that can be activated by contact with specific messenger-chemicals called pheromones, found mostly in body fluids. When activated, VNO receptors cause adjacent ion channels to open or close allowing ions to flood into or out of a neuron. These inflows and outflows of electric charge create voltage surges that can activate a VNO neuron, so that it signals to the brain to turn on a specific behavior. 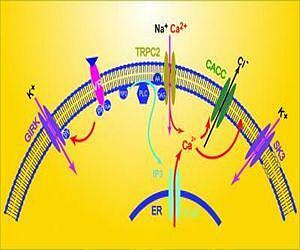 In 2002, as a postdoctoral researcher at Columbia University, Yu was a member of one of the first teams to find that VNO receptors rely heavily on a calcium channel called TRPC2. But there were hints that VNO neurons use other ion channels too; and in a study reported last November in Nature Communications, Yu's team at Stowers, including first author SangSeong Kim, Ph.D., a postdoctoral researcher, found evidence for the role of a chloride-specific channel, CACC. In the new study, Yu, Kim and their colleagues looked for VNO potassium channels, which admit positively charged potassium ions. They began by setting up whole-cell patch clamp tests, in which tiny electrodes measure the net flow of charged ions through the membranes of neurons in a slice of mouse VNO tissue. To determine the contribution of potassium ions to these currents, they replaced the potassium ions in the neurons with chemically similar cesium ions, which cannot get through potassium channels. When these potassium-depleted VNO neurons were exposed to pheromone-containing mouse urine, the usual net inward flow of positive charge was significantly greater than it had been when the neurons contained potassium. That and other experiments with the VNO tissue slices suggested that potassium ions normally flow out of VNO neurons through potassium channels when a VNO receptor is activated. This was not completely unexpected; neurons typically have a greater concentration of potassium ions inside than outside, leading to an outward flow when potassium channels are opened. The outward flow originates mostly from the main bodies of neurons and helps reset neurons to a resting state voltage. However, in the VNO neurons a strong outward flow of potassium also occurred within the dendrites, directly countering the inward flow of positive ions that would activate the neurons. "It seemed a bit bizarre that such an important system would work against itself in this way," Yu says. The team was able to zero in on the two potassium channels responsible, which are known as SK3 and GIRK. But when they set up experiments to evaluate these channels not in VNO tissue slices but "in vivo"-in the working VNOs of live mice-they found a very different result: On balance the potassium channels now sent potassium ions in the inward direction. In fact, these two newly discovered channels seemed to account for more than half of the VNO-activating current. This inflowing-potassium phenomenon is known to occur in another type of sensory neuron, the sound-sensitive cochlear hair cell, whose external environment contains relatively high levels of potassium. "This made us wonder whether the VNO also has a high level of potassium in the fluid surrounding its dendrites," says Kim. It does. It turns out that the standard preparation of tissue slices for the initial patch-clamp experiments had washed away that naturally high concentration. The resulting low concentration had misleadingly caused potassium ions to be sucked out of VNO neuron dendrites when the SK3 and GIRK potassium channels were opened. "It's a cautionary tale that shows the importance of doing in vivo experiments," Yu says. The finding that potassium channels contribute to the primary activation of the VNO could be a clue to the origins of the organ. "We speculate that the VNO may have evolved to have a high extracellular concentration of ions, as well as multiple ion channels, so that it remains functional even when it comes into contact with various ion-rich bodily fluids," Yu says. "The diversity of signaling pathways perhaps make it more robust in triggering innate behaviors." Other researchers who contributed to the research include Limei Ma, Ph.D. and Kristi L. Jensen, of Yu's laboratory at the Stowers Institute; Michelle M. Kim, Ph.D., of Columbia University; and Chris T. Bond, Ph.D., and John P. Adelman, Ph.D., of Oregon Health and Science University.